Your friendly driver will collect you from your Victoria Falls hotel in the early morning and transport you to the park. After an important safety briefing you'll hike down to the notorious Boiling Point to meet your guides. Lifejackets, helmets and other safety supplies are provided and your expert guide will ensure the boat is balanced before your epic journey over level 4 and 5 rapids begins. 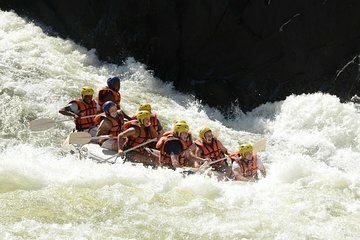 Low water season, when rapids are most intense, is typically between August and December, while high water season occurs between January and March and then again in June and July. Check in advance during April and May to ensure rafting is still taking place if water levels have fallen. You'll hammer your way through notorious rapids with terrifying names like "The Overland Truck-eater" and "Gnashing Jaws of Death." You will not only be enjoying the adrenaline pumping thrill of this exceptional activity, you will also marvel at the stark, sheer beauty and tranquility of the breathtaking Batoka gorge. Upon arrival at your end point, you'll hike with your guide to the top of the gorge and enjoy cold beers, BBQ and fresh fruit. The tour concludes with a slideshow of the day at Shearwater Cafe, followed by a return trip to your hotel.